This is the third entry in a series of posts for ApprovaFlow, an alternative to Windows Workflow written in C# and JSON.Net. Source code for this post is here. •. Allow the state of a workflow to be peristed as an integer, string, etc. Quickly fetch state of a workflow. •. Create pre and post processing methods that can enforce enforce rules or carry out actions when completing a workflow task. Our next goal will be Create pre and post processing methods that can enforce enforce rules or carry out actions when completing a workflow task. We’ll use the Pipe and Filter Pattern to simplify the processing, and we’ll see that this approach not only streamlines how you handle variation in tasks, but also provides a clean method for extending our application abilities. The advantage of breaking down the activities of a process is that you can create a series of inter-changeable actions. There may be some cases where you want to re-order the order of operations at runtime and you can do so easily when the actions are individual components. Before we proceed applying the Pipe and Filter pattern to our solution, we need to establish some nomenclature for our workflow processing. The following chart lays out the vocab we’ll use for the rest of series. State A stage of a workflow. Trigger A message that tells the workflow how to change states. If the state is “Phone Ringing” and the trigger is “Answer Phone” the new state for the phone would be “Off hook”. StateConfig A StateConfig defines a pathway or transition from one state to another. It is comprised of a State, the Trigger and the Target State. Step A Step contains the workflow’s current State. In the course of your workflow you may have many of the same type of steps differentiated by date and time. In other words, when you workflow has looping capability, the workflow step for a state may be issued many times. Answer The Step asks a question, waiting for the user response. The answer the user provides is the trigger that will start the transition from one state to another. The Answer becomes the Trigger that will change the State. Workflow A series of Steps compromised of States, Triggers and their respective transition expressed as a series of State Configs. Think of this as a definition of a process. Workflow Instance The Workflow Instance is a running workflow. The Steps of the Workflow Instance are governed by how the Steps are defined by a Workflow. • Is the user authorized to provide an Answer to trigger a change to the step’s State? • Is a special data set required for this particular State that is not part of the Step properties? • Is the data provided from the user sufficient / valid for triggering a transition in the Workflow Step’s State? • Are there actions to be performed such as saving special data? • Can the system execute custom actions based on the State’s Trigger? This looks very similar to the Pipe and Filter pattern. Every time a workflow processes a trigger, the questions we asked above must be answered. Each question could be considered a filter in the pipe and filter scenario. Our Workflow Processor will function in accordance with the Pipe and Filter pattern where no matter what type of workflow instance we wish to process, the questions that we listed above will be answered. Later we will return to discuss points of where the workflow can execute actions respective to the workflow’s definition. We’ll quickly find that the information regarding whether the result of an action or the condition of a Step will need to be accessible to each of the filters. The class Step is the natural place to store this information, so we will include a property CanProcess to indicate that a filter should be invoked, as well a List<string> to act as an error log. This log can be passed back to the client to communicate any errors to the user. Note that the Step class has the Dictionary property named “Parameters” that allows a filter to pass data on to next filter in the sequence. We also record the name of the filter so that we may interrogate the pipeline should we want to know if a filter has already been registered. Here we check to see if we can process, then perform specific actions if appropriate. Given that the filters have no knowledge of each other, we can see that they can be executed in any order. In other words you could have a Pipeline that had filters Step1, Step2, Step3 and you could configure a different pipeline to execute Step3, Step1, and Step2. FilterRegistry is meant to be run once at start up so that all filters are registered and ready to use. You can imagine how slow it could become if every time you process a Workflow Step that you must interrogate all the assemblies. Pipeline can accept a list of filters along with the string that represents the order of execution. The method RegisterFrom accepts a reference to the FilterRegistry along with the names of the filters you want to use. A lot of talk and theory, so how does this all fit together? The test class WorkflowScenarioTests illustrates how our processor works. 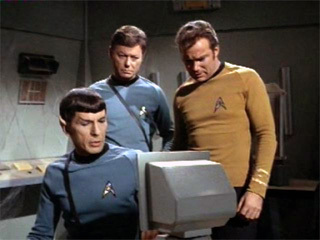 We are creating a workflow that implements the process for a Red Shirt requesting a promotion off a landing party. You may recall that the dude wearing the red shirt usually got killed with in the first few minutes of Star Trek, so this workflow will help those poor saps get off the death list. The configuration for the Workflow is contained within the file RedShirtPromotion.json. There are a few simple rules that we want to enforce with the Workflow. For one, Spock must review the Red Shirt request, but Kirk will have the final say. Study the tests. We’ve covered a lot together and admittedly there is a lot swallow in this post. In our next episode we’ll look at how to the Pipe and Filter pattern can help us with extending our workflow processor’s capability without causing us a lot of pain. Here’s the source code. Enjoy and check back soon for our next installment. Sensei will let you take it on out with this groovy theme (click play).